The idea of coming home after a long day of school should be a relief. But for many students, the hours spent after school are filled with attempts to independently tackle assigned homework, and with the brain already feeling taxed, this can lead to exhaustion, anxiety, and frustration. As a parent, you might be wondering how you can help your child. Consistency and set expectations are traits of a successful homework routine. And yet, while there are proven strategies that equip students to be successful when completing homework, each student has different story, and they will feel ownership of their routine if they see that it reflects who they are as a learner. Read the tips below with your child in mind. Consider how their input and voice can play a role in creating a homework routine that really works—one that offers them choice within a clear structure. 1. Create a distraction-free spot in the home to begin homework. Your child should understand what makes a spot ideal for completing homework. Open the dialogue by asking, “Where do you think that you will do your best work?” Some students might prefer to work independently in their room and show that they take this responsibility seriously. Others might benefit from working in a public place, where multiple eyes are able to check what is happening on the computer screen. If you want your child to work in a public place, tell them why. Perhaps trust needs to be earned before they go work in a place of their choice. If this is the case, ask them, “How can this trust be built? What do you think you need to demonstrate before you work in an independent place?” If they should be in a public place, let them choose where they feel the most comfortable. Students also benefit from sitting down and making a list of what they need to begin their homework. This list should be generated by your child. Older students should take responsibility for writing down the materials and printing copies of this list. Post copies wherever needed—perhaps in the binder so your child remembers what to bring home from school that day and also near the designated homework spot, so your child knows what to take out to begin an assignment. 2. Consult a homework planner. At the beginning of the school year, students typically receive a hardcopy or electronic planner in which to record their homework. As students get older, they begin to voice their preference for what type of planner they use. Encourage your child to their their choice with reasoning. For example, a student with a tendency to lose materials, might ask to record their homework on their computer, which could alleviate the frustration that comes along with a lost planner. 3. Prioritize assignments. Some students prefer to do more challenging work at the beginning of homework time, while others prefer to save this work until the end. Your child will communicate their logic in different ways. Listen to what they have to say and help them think through their strategy. Some students benefit from adult support at the beginning of the week to take a look at the week ahead. Perhaps there is a soccer practice one night a week, and on that night homework time is limited. By talking at the beginning of the week, the homework load can be modified for the weeknight commitments. A timer can help your child stay focused. Allow your child to choose how long the timer should be set to either complete an assignment or take a break. 4. Allow for breaks. Breaks are needed to restore motivation and reset. Working for long periods of time without breaks builds fatigue and exhaustion. Have a dialogue with your child about appropriate times for breaks. Also talk with your child about what an appropriate break looks like and what they need to do during this time to refocus. 5. Work out a system for homework questions. Students are bound to come across an assignment for which there may be unclear instructions or a task that they find challenging. In an effort to be proactive and encourage problem solving, brainstorm ways to tackle these challenges ahead of time, before they arise. Is there a school webpage or an assignment sheet that gives more detail? Could your child call a peer to ask a clarifying question? Does your child have access to the teacher’s email and if so, could they direct their question to the teacher? With your child, note a couple of “go-to” options for when they are feeling stuck and display these problem-solving strategies in your child’s chosen homework space. Now that your child has a plan, it's time to implement the strategies. Be aware that it takes some time to establish a routine, and there will be some bumps along the road. Make sure that expectations are reasonable and that your child feels supported. These tips based on research reported in The Power of Habit: Why We Do What We Do in Life and Business by Charles Duhigg can help your family persist in making the new routine stick. Take note of small victories and build from there! Remember, consistency is important, but if things really aren't working, be sure to talk through the challenges with your child. Listen to what they have to say and any suggestions they might have for tweaking the strategy. Maybe they need to tackle their homework at the same time every day, take more breaks, or limit the amount of time they spend on any one homework assignment. Keep the lines of communication open and maintain regular check-ins to let your child know that you are there to help. 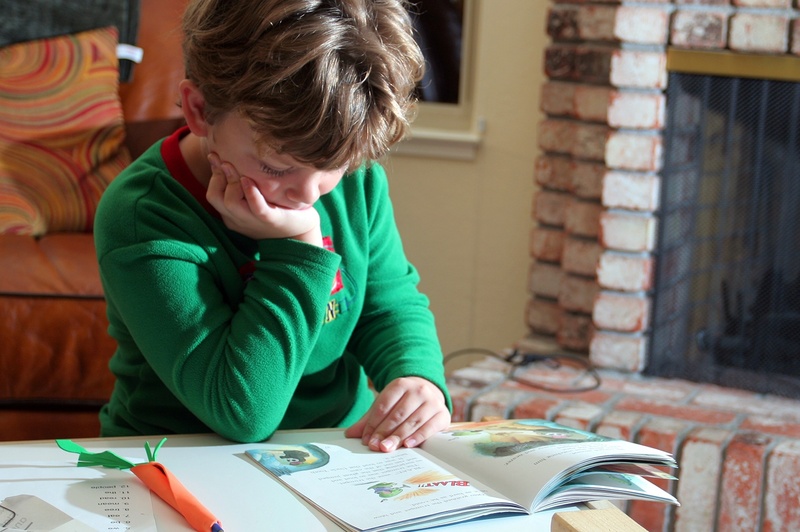 "Aidan in intense concentration while he does his reading homework” by John Morgan is licensed under CC BY 2.0. Liz Moraz earned her BA in English language and literature from Gordon College. After seven years in the children's book publishing industry in New York City, she obtained her MS in childhood special education with a concentration in learning disabilities from Hunter College.